We are on a short break here at DCCS and will be back on Tuesday 7th June at 4.30pm for the first of our regular 2-hour Comics Clubs for 10-13 year olds. Wednesday 8th at 4.30pm will be for 14-17 year olds, and Thursday 9th at 4.30pm for 10-17 year olds. During the break we will hosting a workshop at Dundee Design Festival on Saturday 28th May at 10 am, click the link for details. We are currently putting together a digital comic of the strips created in the last sessions but in the meantime here is a ‘comics mash-up’ taster from all the comics. 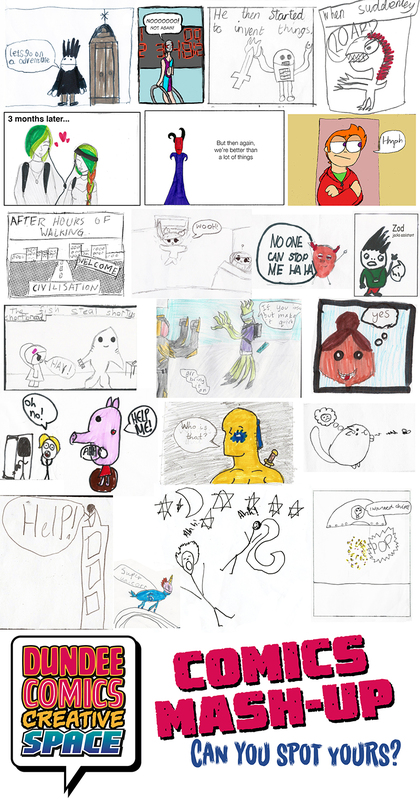 Posted on May 17, 2016 by dundeecomicscsPosted in Comics Club, workshopsTagged comics, design, dundee, festival, mash-up, young people.